A fantastic show again this year from the mother of all Pantomimes, Cinderella. 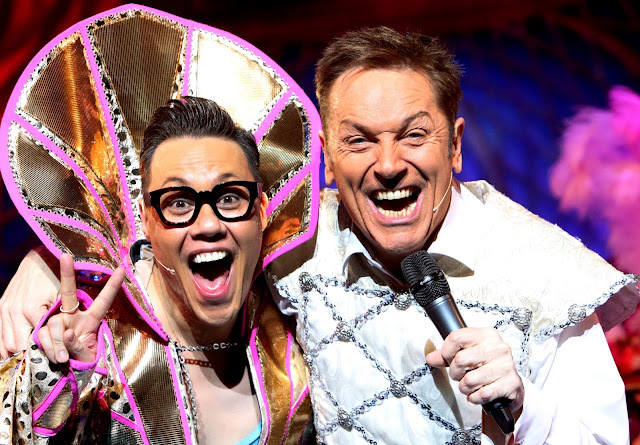 Starring the fantastic Gok Wan and Brian Conley as The Fairy Gok Mother and Buttons. A perfect pairing for the stage as they bounced off one another effortlessly and had the audience in stitches! I was a little worried for the gent sat behind us, thought he might have an accident! Multi-coloured, sparkling, glitz and glam stage set with the usual wow factors – fireworks, flying coach, magic, show ponies, OTT costumes, rude jokes – you name it, they had it. A big shout out the full cast and creatives for putting on such a wonderfully magic Christmas show that kids and big kids alike adored. Thank you to the MK Theatre Orchestra for playing excellent music and we had a few sing-a-longs. The ugly sisters were wicked, very funny and their costumes as always were outrageous. Head over to MK Theatre to catch this year’s pantomime in all its glory – running until Sunday 14th January 2018.